With the shortage of copper on the international market the price of brass has increased by over 80% in the last two years and will continue to increase until it is not feasible to construct padlocks from it any longer. 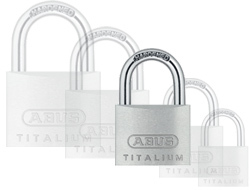 ABUS have been working on an alternative for a long time and have now developed a new alloy called Titalium. As a mixture of both aluminium and titanium, it is both lightweight and stronger with excellent weather resistant qualities. We expect this to replace the traditional brass padlock within 2-3 years. This is the standard open shackle Titalium model suitable for 95% of applications. It has the same high quality stainless mechanism found in other ABUS padlocks with a strong hardened shackle that is finished with a special Nano coating. This basically keeps the shackle rust free more effectively than standard nickel coatings found on other padlocks. All our padlocks are delivered with 2 keys each inclusive of the price but if you require additional keys they can be ordered by clicking here. 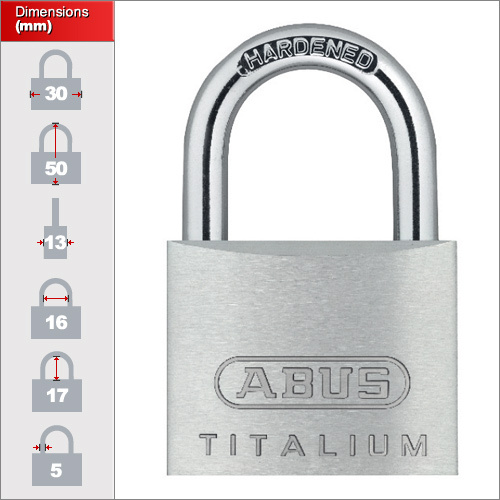 On our website offer five sizes of standard Titalium padlock. 20mm, 30mm, 40mm, 50mm and 60mm. Please select your desired size from the drop down menu above. Each is of the same design and dimensions but have increased security with size. Your choice of padlock size depends on the application. This range is ideal for almost any use. The smaller sizes are ideal for luggage, locks and bags whilst the 50 and 60mm locks can be used on gates, doors and other situations where a more secure padlock is required.